Sometimes I set out to make one dish and end up with something else. Such was the case with this crab and corn ravioli recipe. I had wanted to re-create a corn ravioli dish I had eaten at a local restaurant. The dish had been inspired by the flavors of elotes, the Mexican street corn topped with Cotija cheese, Mexican crema, mayonnaise, chili, cilantro, and a little lime juice. My first attempt was edible but just barely (tons of cheese have saved many a dinners for me). As I was contemplating how to adjust things for a second attempt, it occurred to me that I maybe was a little out of my depth. I was working with a flavor profile that I really wasn’t all that familiar with and that, perhaps, I should leave the Mexican street corn-style handmade ravioli to the professionals. However, I still really wanted to make a corn ravioli. So, I decided that I would stick with flavors I was familiar with which lead to the corn and crab combination. Now that’s a flavor profile I know well (see here and here as evidence) and the filling came together beautifully with the addition of some butter, green onions, and cilantro. I decided I didn’t want to have a cheesy ravioli so I skipped the traditional addition of ricotta cheese and let the crab and corn flavors be the stars. One taste and I knew I had made the right decision. The fact that my daughter was standing over the stove eating the crab and corn filling up with a fork straight from the pan was just extra validation. I had already decided I was going to keep the ravioli making as easy as possible by not rolling out my own fresh pasta dough. 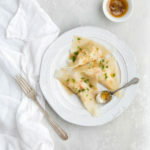 Wonton wrappers work wonderfully as ravioli wrappers in my opinion and I make no apologies for using them here. Despite this shortcut, making ravioli is a bit of a time commitment. So, I wouldn’t recommend taking this recipe on for a weeknight meal unless you don’t mind eating dinner late. But it’s a great weekend meal if you’re looking to take on a small culinary project. I actually find making ravioli relaxing when I’m not pressed for time. The topping of browned butter made this dish for me. If you’ve never had browned butter, don’t dismiss it as just melted butter. It may start as melted butter but once it browns and develops a slightly nutty flavor, it becomes so much more. The tricky part is not burning it. Pay close attention as the color starts to change (using a light colored pan will help) and remove it from the heat as soon as it turn a toasty brown and smells nutty. Then kick back and enjoy the fruits of your labor. Melt 2 tablespoons butter in a large skillet over medium heat. Add corn kernels, red bell pepper and onions. Sauté, stirring occasionally, until the corn is tender, 2 to 3 minutes. Add in half of the chopped cilantro and season with salt and pepper. Stir in cream and continue cooking until liquid is reduced by half, 1-2 minutes. Gently stir in crab and cook until mixture is warmed through. Taste and season with more salt and pepper as needed. Set aside. To make ravioli: Place wonton wrappers on a work surface (3-4 at a time) and in the center of each, place 2 teaspoons of filling. Brush the edges of the wrapper with beaten egg then fold the wrapper in half, enclosing the filling completely and forming a triangle. Pinch the edges to seal, removing any air bubbles as you seal. Transfer the ravioli to a baking sheet. Repeat with the remaining filling and wrappers. Set aside. Working in batches, cook the ravioli in a large pot of boiling salted water until just tender, stirring occasionally, about 4 minutes per batch. With a slotted spoon, transfer the ravioli to a rimmed baking dish lined with a clean dish towel to drain. Melt the remaining 4 tablespoons of butter in a heavy small skillet over medium heat. Continue cooking the butter until it starts to get foamy and begins to turn a golden brown. When the butter is a toasty brown and smells nutty, remove it from the heat. Stir in remaining 1 1/2 tablespoons cilantro. Divide the ravioli among 5 plates. Drizzle the browned butter over the ravioli and serve. The ravioli can be wrapped (but not boiled) up to 2 hours ahead; cover and refrigerate until ready to cook.